Owner and winemaker Ernie Weir started his career at Domaine Chandon while attending University of California at Davis. He began Hagafan in 1979, releasing the first commercial vintage in 1980, while still at Domaine Chandon where he became Chandon's vineyard and nursery manager. Weir began modestly with his own label, producing wine with grapes from Winery Lake Vineyard, increasing production to 3,000 cases by 1990. In 1997, he left Domaine Chandon to build the Hagafan Cellars winery and tasting room on the Silverado Trail in the Napa Valley. Production has increased to 8,000 cases including sparkling wines, coming from the winery's own 20-acre estate vineyard and other select growers primarily in the Napa Valley. Weir is the winemaker. Winemaking is kosher and the Pinot Noir is flash pasteurized for three minutes. The Pinot Noir is sourced from two vineyards in Napa Valley: mid-Valley California Soleil in Yountville and Fagan Creek in Napa Carneros. Multiple other varietal wines are produced as well. Hagafan Cellars wines have been served on numerous occasions at the White House to visiting foreign dignitaries. 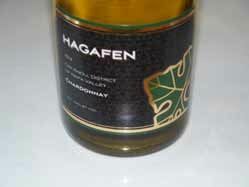 Hagafan Cellars wines are sold primarily to restaurants, mailing list customers, and visitors to the winery. Tasting and tours are available by appointment daily except Saturdays and holidays at 4160 Silverado Trail in Napa.